Principal Woolf speaks at AVS in 2016. Volunteering can be serious business. For Peter Higgins, it is literally a laughing matter. The Artsci’03 graduate is a founding member and current president of the Queen’s Players Toronto comedy troupe that formed in 2004 and has produced more than 20 full-scale and single night shows. Thanks to the tremendous efforts of volunteers, the Players have raised more than $200,000 for charity. Mr. Higgins knows working with volunteers is much different than managing a group of paid employees who are required to do everything the boss says. So to keep his volunteer management skills sharp, he has attended every Alumni Volunteer Summit (AVS) since 2012. “(AVS) is a fantastic way to hone your volunteer recruitment and management skills. It’s also a great way to connect with the broader alumni network and look for areas where you can cross promote, allowing both sides to grow and benefit,” says Mr. Higgins, who says he spends an “insane” amount of time volunteering with Players. This year’s AVS is set for April 6-7 at the Donald Gordon Centre, and attendees can expect a fun night of socializing and networking on Friday night and a full day of workshops and keynote lectures on Saturday. 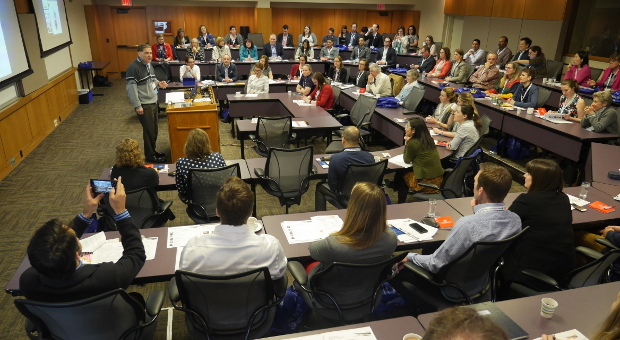 The theme of the summit is “Building a Better Volunteer: From Recruitment to Recognition,” and the featured speakers include Smith School of Business professor Kate Rowbotham and Principal Daniel R. Woolf, Artsci’80. New this year will be a panel session focused on diversity and inclusion featuring staff, student, and alumni speakers discussing the important initiatives on campus – including the Principal’s Committee on Racism, Diversity, and Inclusion and the Queen’s Truth and Reconciliation Commission Task Force. Panelists will answer questions and discuss how recommendations from these initiatives can be incorporated into the activities undertaken by the broader alumni community. Sarah Indewey (Queen’s Associate Director, Volunteer Relations and Reunions, Alumni Relations & Annual Giving) feels AVS is more than just a great learning opportunity. It’s a chance for people in the Queen’s alumni community from across Canada and the world to finally meet face-to-face instead of trading emails back and forth. One member of the Hong Kong Alumni Branch has already registered and a few more volunteers outside of North America are expected to attend as well. “The whole weekend is a great excuse to come home to Queen’s. It’s an exciting weekend on campus with Grad Bash, AVS, and the QUAA Awards Gala all happening and coinciding with the last day of classes,” says Ms. Indewey. Online registration for AVS is now open. Please RSVP by Monday, April 2.